Valid for: Drupal 7, Views 3. I have two multiple text fields on a Drupal 7 content type. 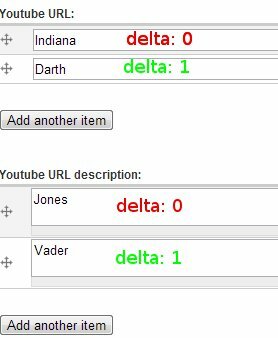 I want to display those fields paired by delta in a view. Here the code I used in my module named mymodule.module. I use this piece of code to pair Youtube URLs and plain text description for a JSON output generated via Views Datasource. Remember to disallow multiple values when adding these fields to your view or you’ll get incoherent results.